There are private jets. And there are private jets. This one may just take the cake. The Dream Jet is part airplane, part luxury apartment -- and for only 500,000 Chinese Yuan, or about $100,000 CAD an hour, it's available for charter. This heavily modified ‘VVIP’ jetliner -- that's very, very important person, because when you’re spending that much you need the extra ‘very’ – began life as a bare-bones 787 Dreamliner. 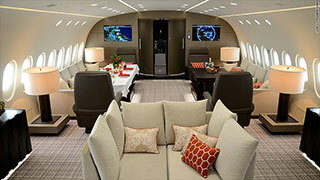 It’s operated by China's Deer Jet, a unit of fast-growing conglomerate HNA Group. HNA recently bought a 25% stake in Hilton. Its Deer Jet unit and the Waldorf-Astoria and St. Regis hotel brands have partnered to use the plane to fly the uber-rich from Hong Kong on trips to Rome, Paris and Tahiti. 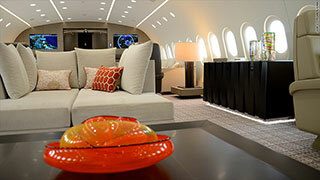 During a recent visit to Seattle, Deer Jet opened its doors to CNN for a rare look inside the converted jetliner. HNA Group CEO Adam Tan had flown in the night before from Doha aboard the jet for a meeting with Microsoft (MSFT, Tech30) founder Bill Gates. "It's really like your home," said Tan. Maybe his home. Probably not your home. Certainly not my home. Nor is it like any ordinary jetliner. As CNN notes: “The entryway bears no resemblance to the typical flying experience, save a green exit sign. You slip off your shoes and enter a circular foyer. One route off the foyer leads down a narrow hallway to the cockpit, one to an expansive sitting lounge and yet another takes you to the master suite. The master bedroom features a king-sized bed and 42-inch TV, the ensuite bathroom has a double vanity and enormous white tiled shower with 60 minutes worth of hot water. On a typical 787 you'd find expandable lie-flat business class seats in the front of the plane. On the Dream Jet, they're in the back, with room for 18. 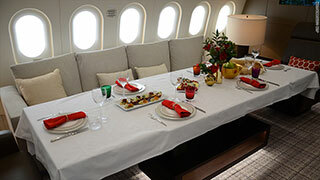 The jet has room for as many as 30, but far fewer are on a normal flight. With a 9,800 nautical mile range, this jet can fly between any two points on Earth. The finished aircraft was sold to Deer Jet in the summer of 2016 and will soon have a sibling. The company has ordered a second Dreamliner which will arrive in the first half of 2018.